May was a big month for us. Brian had a birthday (but doesn’t eat cake), brother Tim turned 40, and my little man Ken turned ONE (And my niece Jade, but her cake won’t be made for another week)!!! 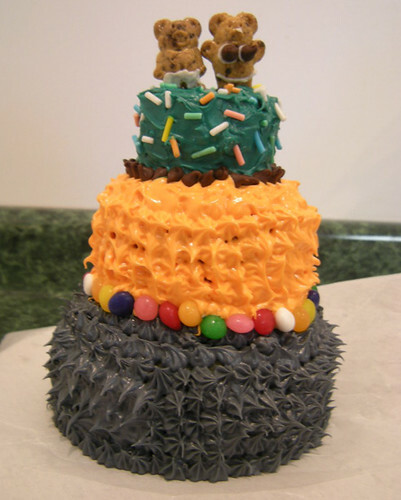 As the official Ray Family Birthday Cake Chef, along with my Sous Chef mom, we had big plans!. 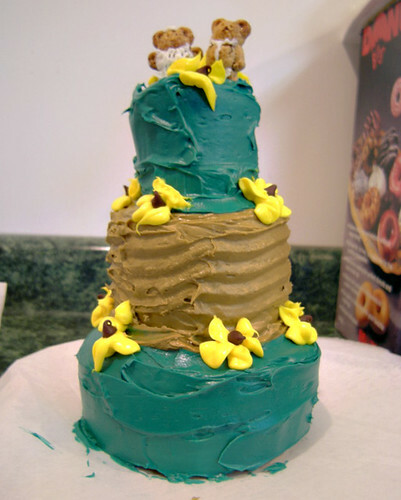 First was Tim’s cake. I wanted to really personalize it, so Brian and I came up with an idea based on his first tattoo, a koi with an “S” in waves behind it. The base is a simple chocolate chip cookie cake. Ok, I threw in an extra bag of white chips too. The cake is from a cake pan shaped like a fish (an AWESOME garage sale find, thank you Brian!). We frosted him in yellow to start. 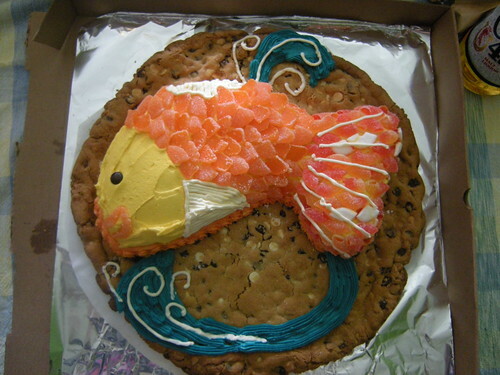 I wanted the fish to have more texture, so the main part of his scales are made from cut pieces of candy orange slices. His tale was from peach rings. I really wanted to use orange colored licorice, but was wayyyy to lazy to visit multiple stores to find it. 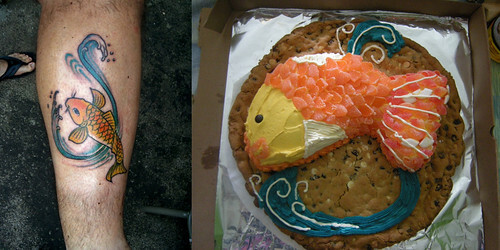 The next weekend was also filled with a sugar coma, from Ken’s Birthday Cake. He’s a little guy, but he needed a big cake. So, four boxes and one batch of chocolate banana cake later, here’s what we got. 1. I WAY underestimated how much time it takes to build a cake. The cakes were all made and frozen the week before, as was the frosting (most of it anyways 🙂 ). But actually assembling the beast was a process. 2. 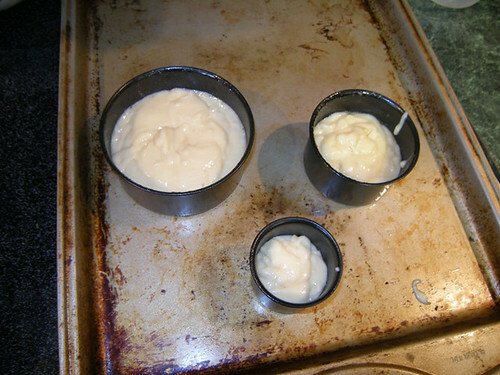 Next time I will build the fondant shapes as I make the fondant. It took way to long to roll out (three colors!) that morning. I could have saved time and gotten it to the correct thickness (half of what it was) if I would have done it on the spot. Traveling back in time, I would have just stacked the shapes between layers of waxed paper. On a positive note: My red and black were RED and BLACK. Yay! 3. Buttermilk makes a heavy cake. 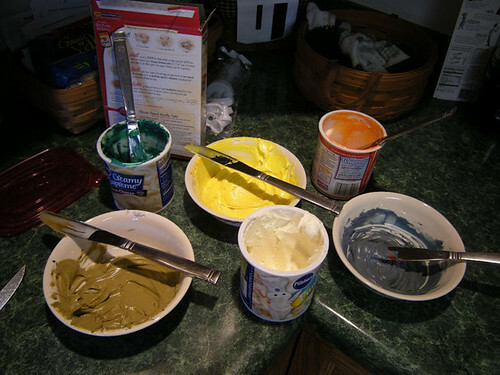 I cheated and used cake mixes. So sue me. But, I did sub buttermilk for water, which I blame for some of the heaviness. 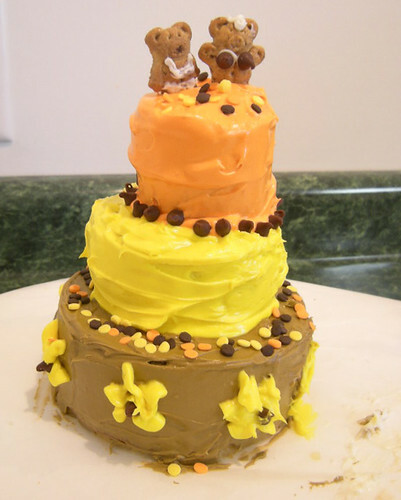 It doesn’t help that I had four layers on the bottom tier, three in the middle and so on. Those dowels and cardboard didn’t stand a chance. Positive: Probly one of the most delicious cakes I’ve ever made! Beckey found this at the Dollar Tree; and it actually works GREAT! Even the frosting syringe! Highly recommended! 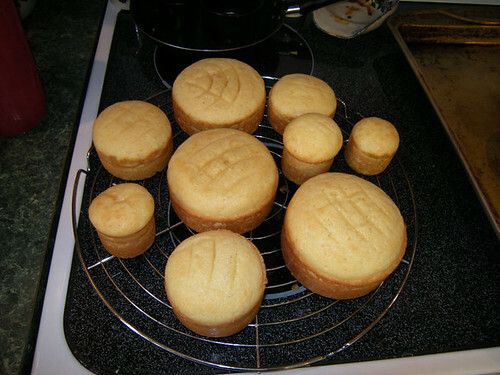 We only had one set of pans, so we had to bake all three cakes separately! We mixed up all kinds of fun colors - teal, brown, orange, yellow, purple, and left some plain white. 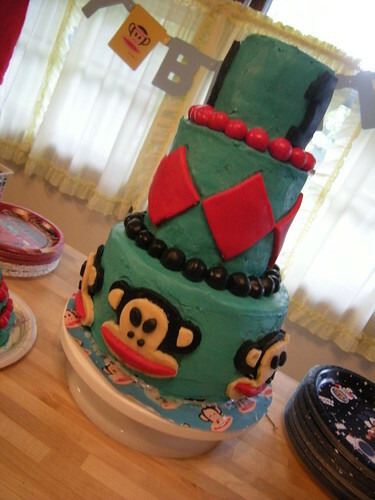 Kristy's Cake. Showoff. The only one of us who has actually taken cake decorating classes. And... Aunt Gigi's cake. I'll perfect my flowers next time. Obviously, next on the list is to make the inside of the cake all pretty before baking – then figure out how to add a filling. 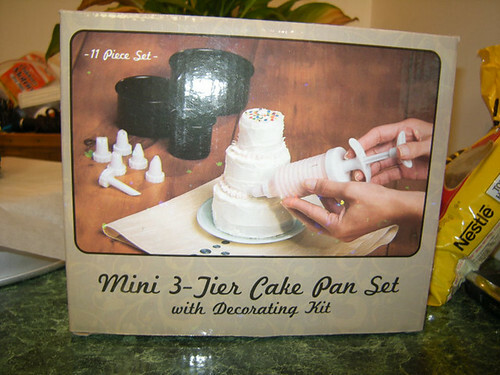 You should probly get off the internets now and head to your local Dollar Tree for your own 3 tier mini cake set.